Minneapolis downtown has its famous Stone Arch Bridge, which was a former railroad bridge over the Mississippi River. Built in 1883, this bridge is made of stone and consists of 21 arches . 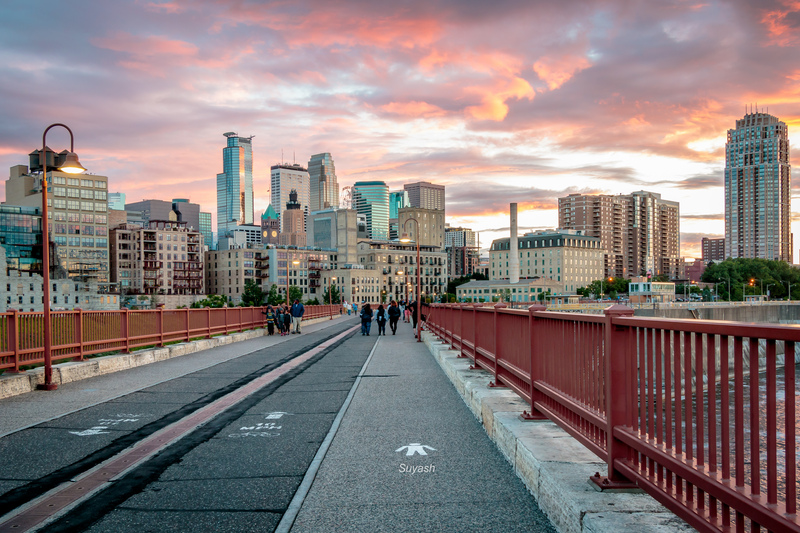 Today this bridge is used as a pedestrian and bike bridge, and provides a panoramic view of Minneapolis skyline and Mississippi river. This post is part of this week’s challenge: Pedestrian. This entry was posted in Minnesota, Nature, Photography, Sunset, Travel, USA and tagged Biking Trail in Minneapolis, Cityscape, Minneapolis, Minneapolis Downtown, Minneapolis Skyline, Minnesota, Mississippi river, Mississippi River Regional Trail, Pedestrian, Stone Arch Bridge Minneapolis, Sunset Colors, Sunset Photography, Think Local Travel Global. Bookmark the permalink. Love that spot in Minneapolis. Once again, phenomenally wonderful photo! Beautiful image. The bridge appears to get plenty of use too! Thanks so much dear. This bridge is a must-visit place in Minneapolis. Beautiful photo, Suyash. You found a great day/time to shoot the photo. I love those colorful clouds. Thanks Helen. I went there a couple of months back around evening time and found perfect clouds and sunset. I am glad I was there that day. I had been there several times and it’s an amazing place to soak in the downtown skyline and the big river, and the panoramic views. Have a great Sunday today!